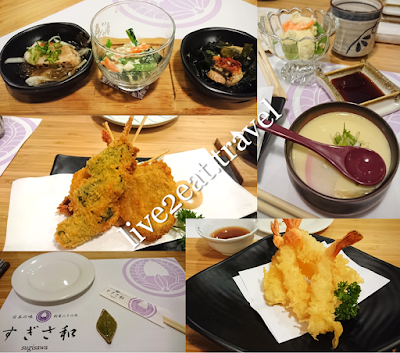 There are many Japanese restaurants at Robertson Quay, so much so that we were spoilt for choice and took a while to decide which to visit. The decision was made harder with no crowd in any of them and hardly any food (that other patrons were eating) for us to see if it looks good. It was too early for dinner and some places were just opening. In the end, we settled for Sugisawa as there was something for everyone. Could neither rave about nor fault the trio of appetiser, potato salad and smooth Chawanmushi. While the ebi tempura was not too oily, could not say the same of its deep-fried lady's fingers and pork that was also a tad tough. The yakitori was too sweet for my liking and its rice utterly disappointing – not only was it not Japanese rice, it was one of the worst I have ever eaten.